In previous posts I have written to you about good things happening in Isinokka, where one of our Agents, Neltharak Idrissil, is busy bringing the Code to the local miners. As his corporation has publicly declared for the New Order, occasionally I get complaints from said locals. But today I bring you a firsthand account, straight from the front line, of what his corporation is doing. Doing for the New Order, doing for you, doing for all of us. So far, not so good. But Neltharak's corporation stood up to these bullies by declaring war against them. The New Order never runs from a fight. But apparently the "Fraternal Order of Raddei" does, and before long our heroes were in hot pursuit of one of their tengus. The tengu pilot, one Korbeen Dallas, attempted to flee, but he was brought to justice. Killmails for the tengu and the pod. 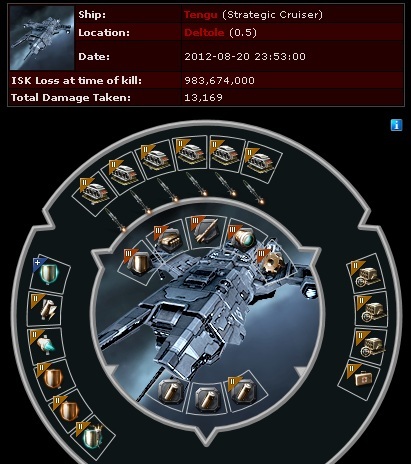 Korbeen lost more than a billion isk, and some skillpoints from the loss of the tech III ship. This turned out to be a great icebreaker for the conversation between Neltharak and Vipieris, the CEO of the offending corp.
Neltharak Idrissil > Do you mind getting another week of war, or shall we discuss the terms of the stopping of the war ? Vipieris > What would I like to do? I'd like to pod your asses to the stone-age. Unfortunately I can't muster enough players at the same time, including myself. Vipieris > Nah - not surprising. Vipieris attempted to rustle up help from allies, but they were of no use. Let this be a lesson: It's much better to rely on people who fight for a cause, rather than a bunch of hired guns who don't believe in anything. Vipieris > Much success. I've learned a great deal about you. Vipieris > No, but nonetheless I'm disappointed in you. Neltharak Idrissil > How so ? Vipieris > You've pledged allegiance to James 315, who from all counts I've read is a shriveling weasel who merely uses the rules of the game against its players. Neltharak Idrissil > I do not think it is in your corporation's direct interest to keep the war alive. Neltharak Idrissil > Your tengu pilot is on the verge of ragequitting, from what i've got. Vipieris > I don't fly by luck. I think Korbeen was careless and I believe he feels the same as he hasn't been on since. Korbeen, if you're out there, don't quit EVE. You'll always have a place in the New Order bumping your former corpmates. Drop me a line. Vipieris > I have no interest in paying you. I have no need. My friends can always resort to the same cowardice that your "savior" employs - hiding in NPC corporations. As for me, I don't support your cause, or your methods, and I will not fund either. At the end of the day, of course, the Fraternal Order of Raddei did fund the cause, since more than 350 million isk worth of loot from the tengu dropped. It's like I always say to the miners I bump: You're going to pay anyway, so you may as well get credit for it. You're going to pay anyway, so you may as well get credit for it.